Pros: The selling points of Hamilton Beach 33967 are its thermometer probe (see the picture on the right) for its probe cooking mode, and clip-tight gasket lid. The thermometer probe is inserted into a designated hole on the lid to monitor the food temperature, particularly the meat and veggies. There are meats that need a specific temperature to tenderize and veggies to soften just a little bit. The clip-tight gasket lid saves time when you need to place the entire pot onto a holder on the table. It will not spill. Cons: On the other hand, users caution about the complex of its control panel, which takes time familiarizing how it works. Home cooking has never been easier with Hamilton Beach 33967 slow cooker. It is a chef’s best friend in the kitchen. It allows you to cook meals without having to neglect all other duties because you do not want to overcook your cooking. Hamilton Beach is a set and forget programmable slow cooker. It can be set to cook a meal in seven hours or so without a round-the-clock monitor. It is an easy-to-use programmable cooking with as simple as adding the ingredients into the pot, which is then inserted into its electric base. And you select the cooking option. Hamilton Beach 33967 only requires you to set the timer to a specified time to finish the cooking and you can forget about it to tend to your other obligations. It has three cooking mode that you can set from its temperature probe: manual slow cooking, programmed (timed) slow cooking, and probe (automatic) slow cooking. You can use any of these three depending on your situation and time freedom. Program cooking is best when you only have enough time to add the ingredients and you are off to work. When the timer is up, the cooker automatically shifts to “keep warm” to prevent from overcooking, yet warm enough to eat for dinner. 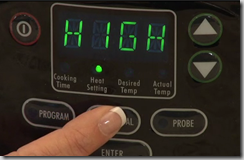 Manual cooking, on the other hand, allows you to select heat settings such as high and low. It is great for traditional cooking when you have the time to monitor the cooking process. There is no time set; no heating up of leftover. Meanwhile, when you are cooking large-cut meats or when the recipe requires a certain heat temperature, the probe cooking is your choice. Hamilton Beach has its own thermometer probe which is inserted into the meat to monitor the food’s temperature. So, upon reaching the specified food temperature, the cooker will automatically set to “keep warm” setting. Users can operate on the cooker’s cooking option from its unique touchpad control panel. It has 2-inch digital display panel that shows the actual or desired temperature settings—like the high, low, and warm—and the countdown timer. Hamilton Beach’s slow cooker pot is made of stoneware. 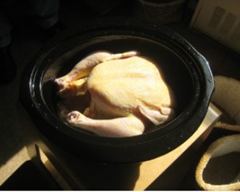 Its 6-quart capacity can accommodate a whole turkey or ham of up to 7.5 pounds. Hamilton Beach 33967 programmable slow cooker is easy to clean. All its accessories are dishwasher agent-safe, although they are made of plastic. The pot itself is made of stoneware, which is a semi-vitreous ceramic ware. It does not break, absorb or retain dishwasher agents during washing. The lid is tempered-glass, which is easy to use with warm and dishwashing agent. The side handles and the entire housing are made of stainless steel, which can be cleaned by wiping a clean damp cloth. The safety system of Hamilton Beach is well planned. Its clip-tight gasket lid protects the food from spilling and your hands from burning. Its full-grip metal handle extends far enough away from the cooker for easy transport of food and for tailgating party and picnics without safety-worry. The three options of cooking are designed not only for convenience but also for safety of household. 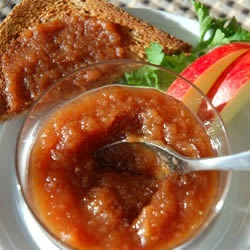 It is a slow cooker programmable to finish cooking just in time. The food never gets burned, the electric base is equipped with power interruption protection so the cooking never gets interrupted and it never overheats. The chosen cooking option and heat settings are digitally displayed so you would know the status of cooking on whatever cooking mode it has been set. 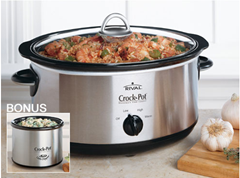 Hamilton Beach slow cooker measures 18.5 inch wide, 12 inches deep, and 7.5 inches tall in a stainless steel black pot. Its pot’s dimensions are 16 inches x 10.4 inches, and 16.1 inches. The whole cooker weighs 14.3 pounds and 15 pounds when shipped. Its capacity is 6 quartz, which is large enough to cook food for the entire regular size of household. Upon purchase, Hamilton Beach 33967 slow cooker comes with a plastic serving spoon that clips onto the pot’s lid for easy storage and transfer. The spoon can be used to stir and serve food. It also has a recipe booklet and a user manual. Amazon’s Hamilton Beach 33967 earned 676 customer reviews and ranks 9 on Amazon’s top 100 bestseller kitchen and dining wares. We love this product! The features on it are fantastic. I love this crock pot. It has two outstanding features that the others don’t–The snap on lid and the “keep warm” feature. 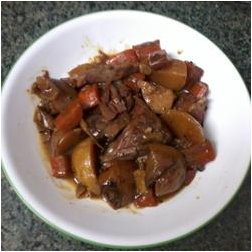 In the past I have used crock pots that would cook with the setting of a manual dial. Purchased this slow cooker a few months ago, and to be honest, I don’t know how I could have lived without it. With three different modes (timed, manual, and temperature sensor), it is streets ahead of the competition. On the other hand, users caution about the complex of its control panel, which takes time familiarizing how it works. For all its amazing features, Hamilton Beach 33967 is only priced at $59.99. In Amazon, the cooker’s price is at discount and is inclusive of super saver shipping. You can check Hamilton Beach at Amazon and see today’s deal.